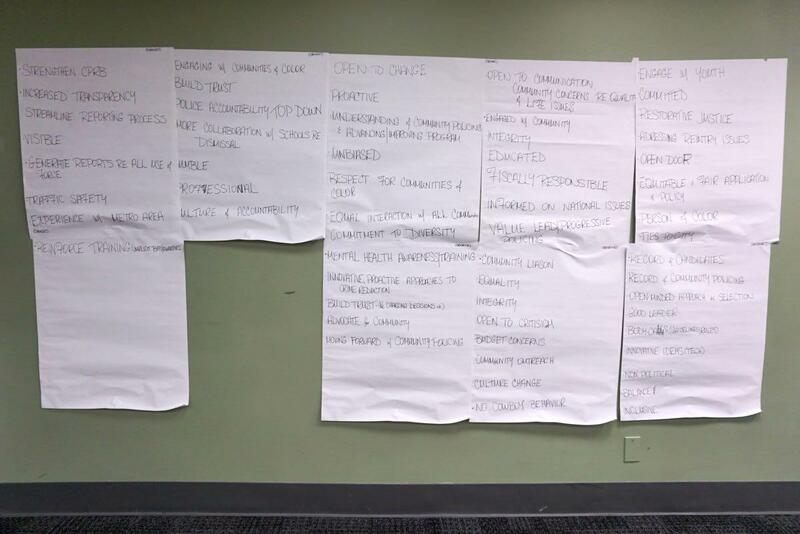 Those were a few of the characteristics people said they'd like to see in the next Albany police chief during a public forum at the Albany Public Library Monday. It was one of three forums this week the city has been conducting as it starts the search for a permanent chief. And in a sense, the events are the start of the next chief's term -- whoever that might be. 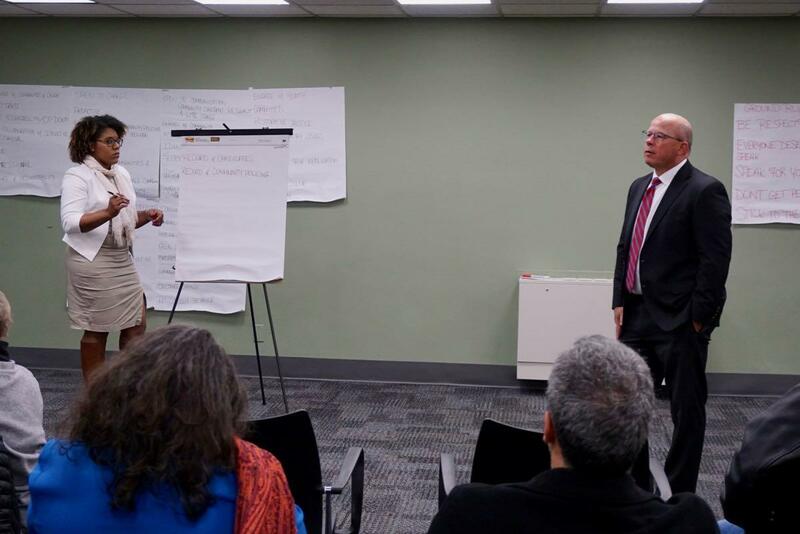 "The more inclusive you are, the more community involvement you have, the more transparent you're going to be in your process and ultimately that provides legitimacy for the selection," said Gary Peterson of Public Sector Search & Consulting, Inc after Monday's meeting. He's assisting the city with the chief search. "And when you onboard the new chief they come in with the vote of the community, the community support. Versus if you completely exclude the community they don't have a voice, then the new chief is coming out with a strike against him or her." The crowd of more than 50 people had a lot to say at Monday's meeting, and many of the comments were critical or expressed a desire to something different. But just as a starting point, it's important to note that people seemed generally supportive of the overall current direction of the police department. Specifically, there appeared to be virtually unanimous support for the orientation the APD has had toward community policing principles under the administrations of chiefs Steven Krokoff, Brendan Cox, and current acting chief Robert Sears. Attendees at the meeting like the idea of officers getting to know people on the street. They like the idea of neighborhoods working collaboratively with the department. They like the idea of officers being engaged with kids in the city. If anything, they want to see a lot more of this approach. 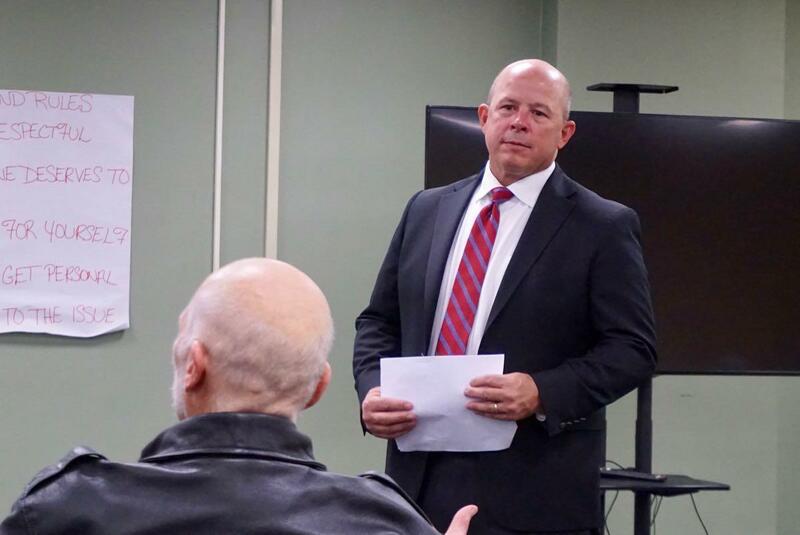 After Monday's meeting, Gary Peterson -- the consultant helping the city conduct the search for a new chief -- said community policing was clearly a priority and experience with it would be one of the key criteria in screening potential finalists. OK, all that said about the general direction of the department, people at Monday's meeting also had some serious and critical comments about the day-to-day operation of the department. There were complaints about police not being a consistent, positive presence in neighborhoods, about a lack of respect from officers, about people being hassled simply for being out on the street or coming home from work late at night. There were stories about times when people felt officers had used excessive force. And, most prominently, multiple people in the crowd expressed dismay that, in their experience, people of color often are treated differently by police. It took the crowd a few comments to work up to this topic -- you could almost sense that people didn't want to be the first one to bring it up -- but when it did finally come up there was an audible stirring from people supportive that it had finally been broached. As one person put it simply: "We need to be cognizant that our people, African Americans, are treated differently." Toward addressing that issue, multiple people expressed support for the implicit bias training that the department has engaged in recently. They called for it to be continued and repeated. And a few people even mentioned the idea of making it available to members of the general public. "Implicit bias is real. People do things without thinking. We need to really understand that." "Implicit bias is real," said one African-American man, emphasizing the importance of everyone considering how they process the world around them, and reflecting on his own biases that had surfaced during an online implicit bias test he'd taken. "People do things without thinking. We need to really understand that." The city of Albany's Jellisa Joseph (left) and Gary Peterson of Public Sector Search & Consulting, Inc. The city of Albany has a diverse population -- more than 40 percent of its residents are people of color, according to Census Bureau estimates. And there was a strong preference expressed by Monday's crowd to see a pool of candidates that looks like the city. "Diversity is like being invited to the dance. Inclusiveness is like being asked to dance. And that's what most people are asking for." "It's more than just diversity -- it's inclusiveness," said Jellisa Joseph, reflecting on what people in the crowd had said they'd like to see see in the next chief. She's the city's chief diversity officer and has been coordinating the community forums. "Somebody who makes all of the diverse communities in the city of Albany feel like they're included. Diversity is like being invited to the dance. Inclusiveness is like being asked to dance. And that's what most people are asking for." Some job qualifications fit neatly on a resume -- education, job titles, accomplishments. But others can be a little harder to pin down, but that doesn't make them any less important. In fact, they might be among the most important. One of the recurring themes of the comments at Monday's meeting was a desire for a chief who listens well, who can relate to people, who has humility. And those desires intersected with calls for accountability and trust. "You never hear 'we were wrong'," said one woman of situations where police potentially face discipline. "And no one is always right." There are going to be times when being chief means facing members of the public who are upset or unhappy or critical. 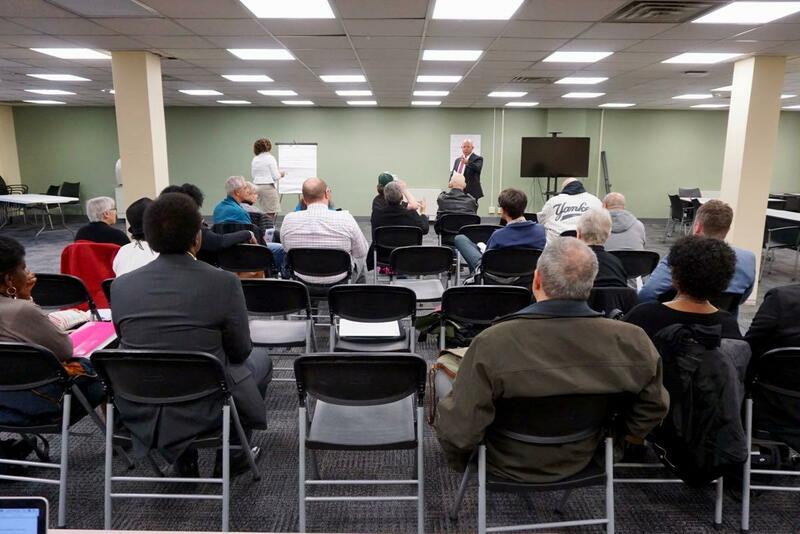 If the city can find a person who can credibly listen to those complaints, be honest about what's happened, and explain how things can change, it could go a long way to toward continuing to build trust with the community. You can click the photo for a larger view of the collected comments. And all this kind of funnels down to one point: People want to see real action on their issues of concern, from top to bottom. 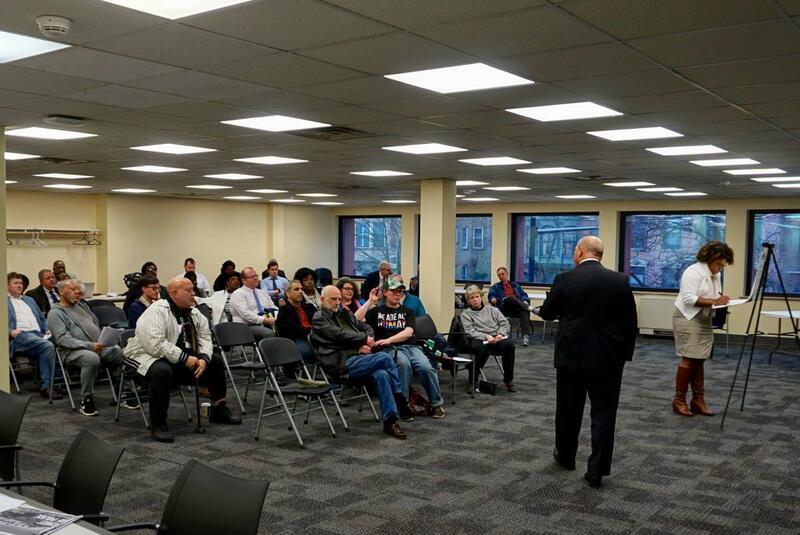 It has been a recurring comment -- not just at this meeting, but at many others in the past -- that people like what they hear from the leaders of the police department, they're just not convinced those words have always translated into action on the street. "It's easy to say things, it's another thing to actually say those things and try and put them in action. And that's what people are looking for when they make these requests for the kind of person that they are looking for. They want somebody who's not just going to say the right thing, he's actually going to do it -- he or she is going to step up to the plate and respond to the community." 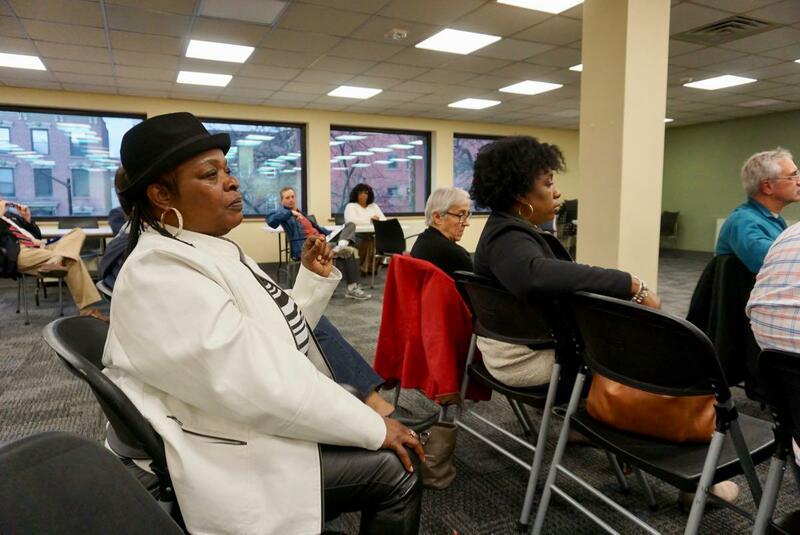 "It's easy to say things, it's another thing to actually say those things and try and put them in action," said the city of Albany's Jellisa Joseph after Monday's meeting. "And that's what people are looking for when they make these requests for the kind of person that they are looking for. They want somebody who's not just going to say the right thing, he's actually going to do it -- he or she is going to step up to the plate and respond to the community." So one of the key questions in picking the next chief is whether the city can find a person who can the make the case for why they'll be able produce change at every level of the department. The city will be posting online an overview of the public input gathered at these forums. Gary Peterson, the consultant assisting with the search, will condense the themes and include them in the listing for the position. He'll then collect applications, go through an initial screen, and the goal will be to pull together a pool of 8-10 candidates. The city will then interview and go from there. The choice of police chief rests with the mayor. + Albany mayor Kathy Sheehan's comments during last fall's mayoral campaign about why she had waited to conduct a national search for the next permanent chief. If we are really interested in making a difference in people's lives, I suggest ditching the bogus "implicit bias" nonsense and focusing on explicit policing priorities and policies, the reasons supporting them, and the outcomes of pursuing them.